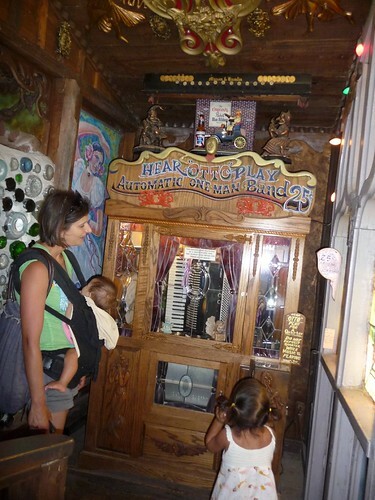 Mali Mish – Day 109: Tinkertown Museum. 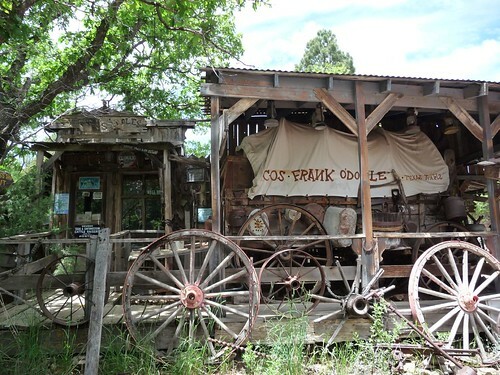 Just up the hill from Albuquerque in a little town called Sandia Park lies an old general store. 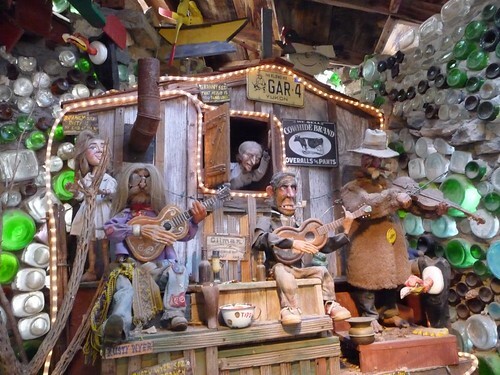 In 1962, a man named Ross Ward began carving, painting and tinkering little wooden figures on his property. 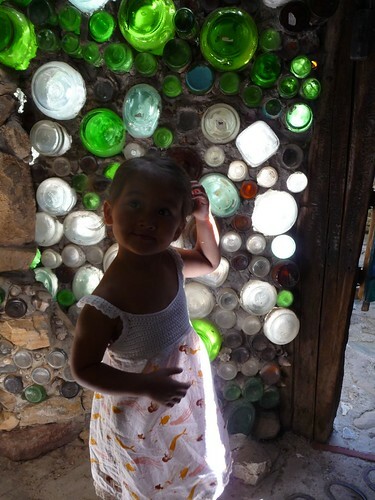 Ross worked on little projects on his spare time for nearly 40 years and eventually turned this place into an amazing folk art exhibition. Diagnosed with Alzheimers in 1998 at the age of 57, he stopped working on the museum and passed away a few years later in 2002. 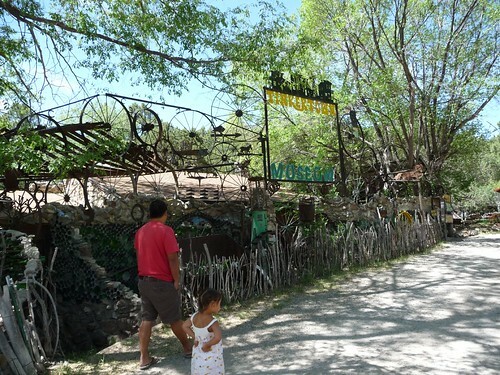 Today, Ross’ family keep the place running in honor of his legacy and dedication to making Tinkertown a special and unique place. 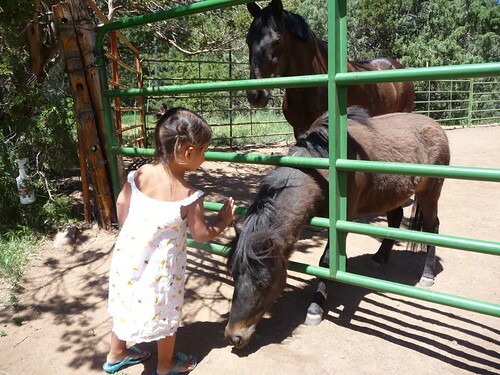 As you pull into the parking lot of the property, you see a little horse corral right up against the edge of the property. Aside from a couple of full size horses, there is also a miniature horse named Tinkerbell. Needless to say, Ava thought it was ‘just her size’. Well, let’s get started with the tour! The first thing you see at the entrance is this band of misfits playing away at their stringed instruments right against these beautifully sun-lit glass bottle and mortar walls. 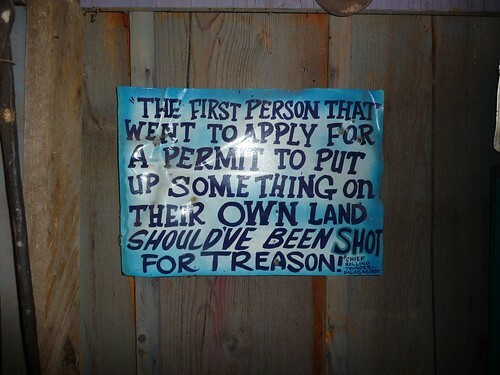 It sort of sets the tone and gives you an idea of what to expect. What is in this dark room? 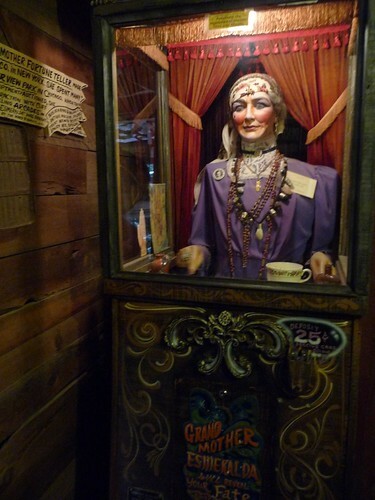 It’s a spooky fortune teller named ‘Grand Mother Esmeralda’. Ava was not a big fan. All along the tour there are lots of interesting quotes painted on the bottom of every day objects. 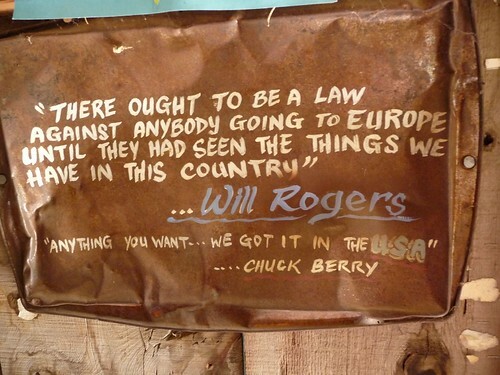 This Will Rogers quote on the bottom of an oven pan pretty much sums up our road trip. Along one of the first hall ways, there is one of the biggest diorama I have every seen. The detail put into each of the characters and objects in it is unbelievable. 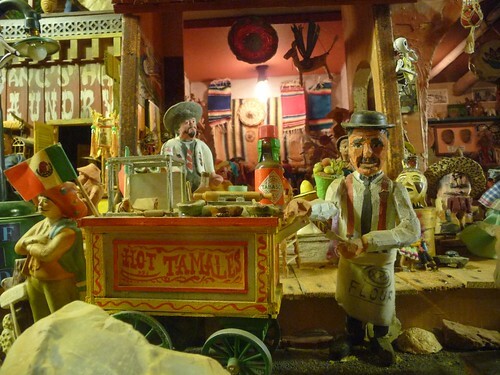 This photo is a close up of a hot tamales vendors along a 30 ft long glass display filled with intricate and wonderfully crafted scenes. Off to the side along a walk way takes you to a landlocked sailboat. Having been a sailor for many years and always pondering the idea of traveling the globe seaward, I had to find out what this is all about. 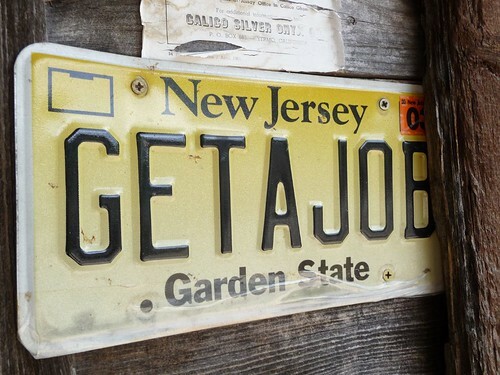 The boat’s name is Theodora R. Owned by the brother of Ross’ widow Carla. 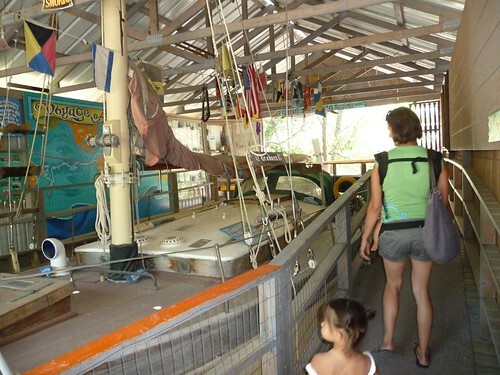 He spent 10 years sailing around the world between 1981 and 1991 before finally settling on an island in the Bahamas. Theodora R. now is berth well above sea level hundreds of miles away from the ocean. 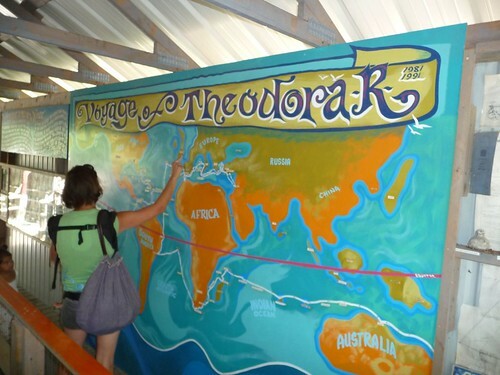 A map next to the dry dock shows just where Theodora R. has been on its trip around the world. Back on the tour, we got to see the ‘Automatic One Man Band’. Probably better named as the no man band. The one liner quotes continue along the tour and somehow I could not find any that I really disagree with. 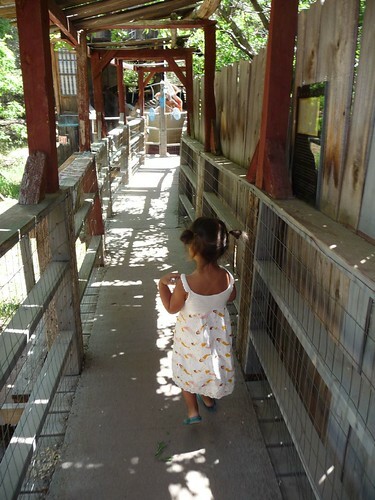 The last part of the tour takes you outside of the main building to an authentic covered wagon. It definitely has seen better days. On our way back down towards Albuquerque, we spotted a little pizza joint off to the side of the road called Sandia Crust Pizza Company. Even though there was no one there at the time, we decided to give it a shot. The pizza was pretty amazing. 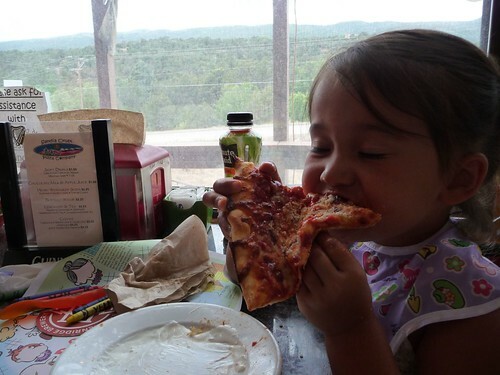 Just look at this picture of Ava in pure pizza bliss. 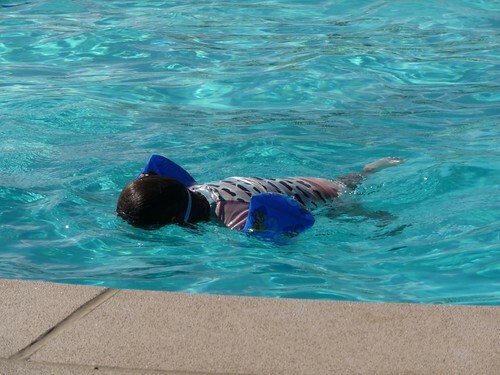 Well, back down at the KOA, time again for us to take advantage of the KOA’s swimming pool. 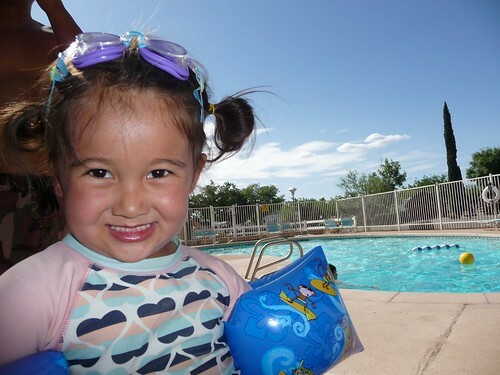 Check out those sweet monkey floaties Ava got from her new friends in Oklahoma! She is loving her new found skill of swimming with her Ariel goggles. She doesn’t even have to pinch her nose when she goes under liker her mama! 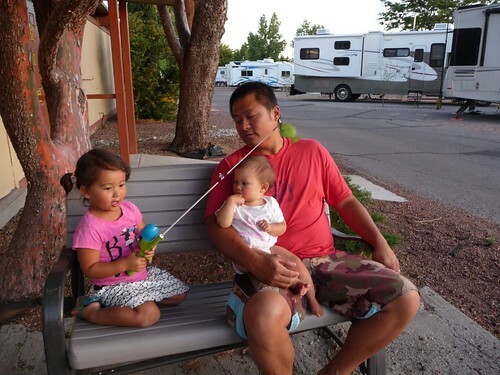 OK Ava, time to catch us a big one for dinner! 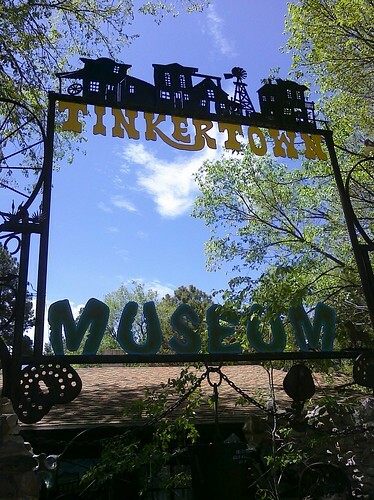 One Response to Day 109: Tinkertown Museum.